The Challenge: Draw a funny picture and hide it in an unexpected place for someone else to find. I spent almost all of today on planes heading home from CA, so this gave me some prime opportunities to hide a funny picture. If you’ve ever flown then you are undoubtedly familiar with the Sky Mall Magazine that is located by the puke bad in the seat ahead of you. I thought this would be a perfect spot to tuck away a funny hello. I specifically decided not to include it in the airline safety information booklet because no one ever really looks at those. It would be years before someone finds my picture there. I wish I could hide a miniature video camera to catch the reaction of the person when they find this picture. 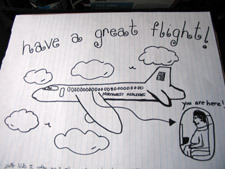 I even wrote on there to check out www.EscapePlanBlog.com to see why I did this. Who knows, maybe that person will comment on today’s post about finding it. I had to take advantage of being on a plane today. I pulled out the "motion discomfort" bag (which I am both happy to say I’ve never had to use and sorry to say I’ve never been able to see anyone use) to serve as my canvas. I thought of putting some uplifting or encouraging words for the person who may ultimately use it. A little Hallmark moment, if you will. For some reason, the thought of Garth from Wayne’s World came to mind. Specifically the part when he said, "If you have to spew, spew in this." 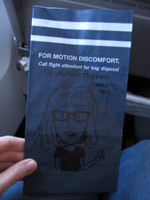 That gave me inspiration for a great illustration — the bag needed a little gussying up. I’m sorry to say that the likeness of Garth was marginal at best. It’s not like I had an arsenal of reference photos at my disposal (and if I did, I would’ve gladly traded them for more leg room.) My imagination runs wild thinking about the people who will end up seeing my little work of art, hoping they’ll giggle hysterically and pass the bag around the whole plane for a big laugh. Party on! Or maybe they’ll look at it and say, "Who’s this supposed to be?" We both spent some time after work doing a little drawing for each other to find. It was quite funny. Doug’s pencil kept breaking and Katie was laughing while drawing hers. It will be interesting when we find each other’s drawings somewhere around the house. My art work reminds me of when we have the grade school kids in our town work with the local newspaper and they draw up an ad for the lumberyard. My boss’s nephew Chadd loves bagels. His aunt runs the local bagel shop in Peru, Il called 4th Street Bakery. From time to time she gives Chadd the “seasoned” bagels. He brings them down to the lumberyard puts them in the freezer and charges us a quarter each. This masterpiece will be duct taped to the inside of our freezer at work for someone to discover. I drew a picture of some midgets on each others shoulders wearing a long coat. It’s in the first men’s toilet cubicle at work. I just wanted to let you know, I decided on putting the drawing in her freezer. I made a very silly face with a speech bubble that said “Brrrrrrrrrrrrrrrr!! It’s cold in here!” Hope she smiles when she has to get the frozen corn. Draw a tiny spiral… lengthen the last bit and use that to start another spiral going the other way down. Legs and a beak make it a bird of sorts. Add another one facing it and use it as the basis for a cartoon; zillions of permitations. I love the term “doodlesmile.” I’m going to use it in a sentence at least once a week. I drew 2 doodlesmiles, laughing all the while. One was very well received, the other has yet to be found. One of my favorite challenges so far!